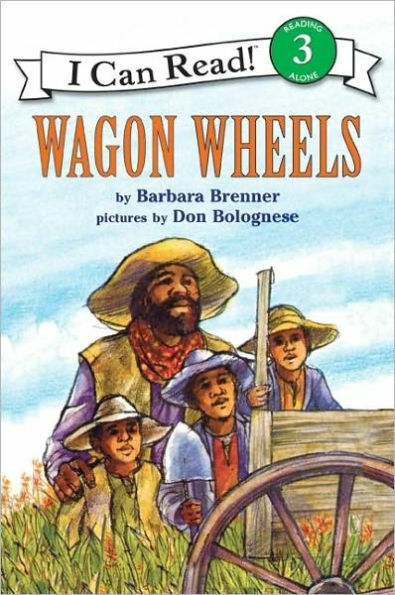 Based on the true story of black homesteaders in Kansas, Wagon Wheels reads like an adventure tale. A father and his three sons must overcome a fierce winter storm, brush fires, and a 150 mile journey on foot in their quest to establish a new home in Nicodemus, Kansas. Nicodemus in northwestern Kansas was the largest black homesteader colony, with 300 to 400 settlers living there in the 1880s. Along with the Topeka, Kansas courthouse where the civil rights case Brown v. Board of Education began, Nicodemus is arguably the most important black history site in the Great Plains. Invite students to learn more about back homesteaders. Use a map to locate Nicodemus and other black homesteads. Visit the National Park Service Historic Site. Make a three column chart with the headings: 1. Why did people homestead? 2. What challenges did black homesteaders face? 3. What is the status of black homestead communities today? Add at least three ideas in each column. Send me your chart to be shared on the LitART website. Books are a great way to introduce students of all ages to the contributions and achievements of Black Americans to our shared national history. This month we will highlight books from the LitART Curriculum along with LitART teaching tips. Each selected title delivers a unique presentation of an event, person, or place essential for understanding black history. Contact LitART for free copies of teacher and student guides. Use the LitART reading, comprehension, and vocabulary strategies to build student literacy skills.